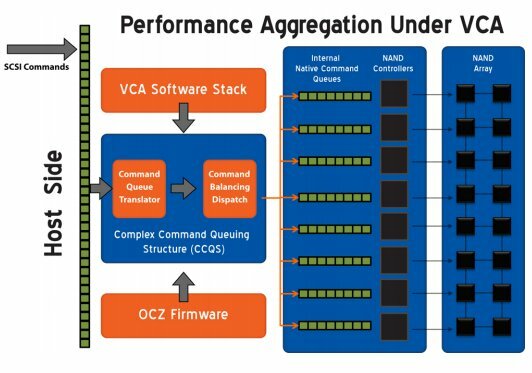 OCZ Technology Group, Inc. (Nasdaq:OCZ),a leading provider of high-performance solid-state drives (SSDs) for computing devices and systems, today announced the release of the second generation of its proprietary Virtualized Controller Architecture (VCA). Leveraged in OCZ’s PCI-Express (PCIe) and SAS SSD solutions for workstation, enterprise, and OEM clients, VCA 2.0 supports a rich enterprise feature-set enabling unprecedented flexibility, increased performance, and the reliability required for high throughput storage systems. Building on the company’s first generation VCA technology, which was originally deployed in OCZ’s Z-Drive R3 PCIe and Talos SAS SSDs, VCA 2.0 provides even greater enterprise flash management features. In OCZ’s enterprise PCIe devices, VCA 2.0 supports the creation of a virtual pool of logical units (LUNs) and features best-in-class configurable performance aggregation, simplifying data management without impacting performance, to provide clients with an easily deployable total solution. VCA 2.0 is the only virtualization layer in the industry with TRIM and SCSI unmap support, which enhances the sustained performance by significantly reducing the overhead associated with garbage collection. Additionally, VCA 2.0’s user-selectable data recovery and non-stop modes allow for unprecedented data protection, while consolidated SMART support provides system administrators with advanced features for monitoring, analyzing, and reporting device attributes. Unlike other flash virtualization layers, VCA 2.0 also supports complete power fail protection. In the event of unexpected system power loss, OCZ’s enterprise power fail protection completes all in-progress transactions, protecting the integrity of all active data. When combined with OCZ’s SuperScale™ storage controller, VCA 2.0 provides unique benefits to users by allowing certain direct memory access (DMA) and data management functions, including OCZ’s unique command queuing and queue balance algorithms, to be handled by the onboard processing core. This results in higher performance and reduces the burden on the host CPU. VCA 2.0 technology will become available with the launch of OCZ’s upcoming workstation and enterprise-class PCIe SSDs, including the RevoDrive 3 and Z-Drive R4.